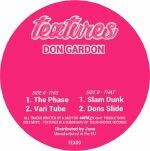 Review: Aubrey's Don Gardon alias was a one-shot decoy deployed in 1997 with the now highly sought-after "Textures" 12" on Aubrey's own Textures label. While the provenance of these new tracks is a little foggy at this stage, what you can be sure of is the grade of techno we're dealing with here. Aubrey's illustrious career speaks for itself, and so do these tracks in the first Textures release since 2001. "The Phase" is an effervescent, funk laced race to the stars, while "Vari Tube" takes a more intimate route through dusty house that wouldn't sound out of place in the Workshop stratosphere. "Slam Dunk" is a cheeky, jazzy affair while "Dons Slide" gets a little more freaky and far out in the finest tradition of B2 tracks.